Take potatoes in a large bowl add corn flour, green chilli paste and salt. Knead into dough. Roughly mash green peas in a bowl add green chillies, coconut, salt, one teaspoon sugar and one tablespoon fresh cream. Mix well. Take a portion of the potato mixture and flatten it in your palms, place a portion of the green pea mixture in the centre and shape into a medium sized ball. Take refined flour in a bowl add sufficient water to make thick slurry. Spread breadcrumbs in a plate. Dip the pattice in the slurry and then coat with breadcrumbs and deep fry in hot oil till golden brown and crisp. Cool, peel and grind tomatoes into a smooth puree. Heat one tablespoon oil in a pan. Add tomato puree and sauté for two to three minutes or till the raw flavour is gone. Add tomato ketchup, salt, remaining sugar, red chilli powder. Mix well and simmer for one to two minutes. Add lemon juice and mix well. Add remaining tablespoon cream and mix well. Arrange the fried pattice in a baking dish. Pour prepared tomato gravy over it. 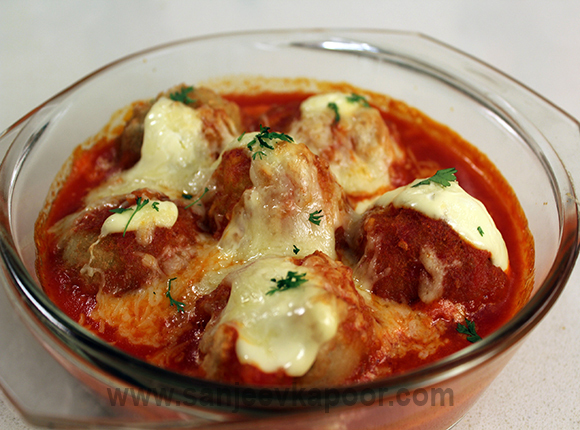 Spoon a dollop of fresh cream over each pattice and sprinkle with grated cheese.